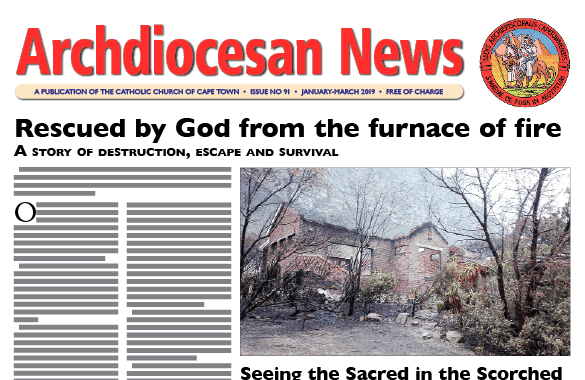 HOT OFF THE PRESS: Rescued by God from the furnace of fire; Seeing the Sacred in the Scorched; Fire ravages Holy Cross Primary in District Six; NET Ministries; Celebrating our new deacons; Interested in forming a Co-operative Bank/Credit Union? 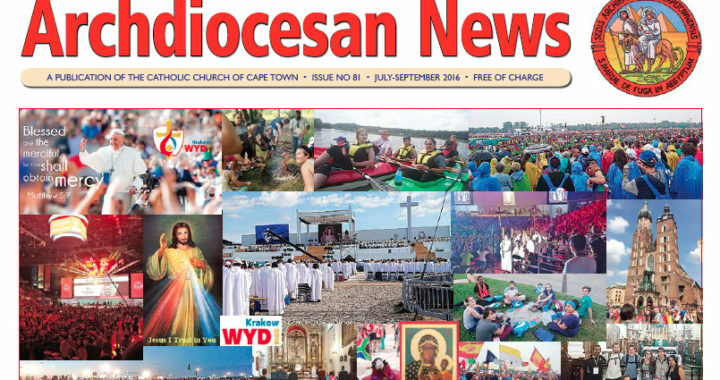 ; Celebrating World AIDS Day; Filipino Community recognised in Kalk Bay; Blessing and welcoming of newly initiated; Lentegeur host second women’s conference; A Celebration of Light and Life; AoS South Africa assists abused fishermen; Holy Week Word Search. 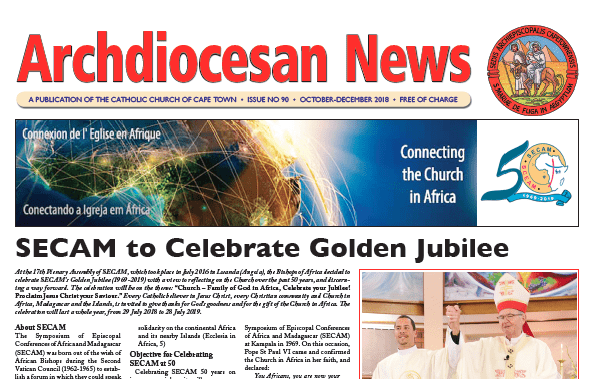 In this edition of Archdiocesan News 4 of 2018: SECAM to celebrate Golden Jubilee; What to do when a child goes missing; Divine Renovation – Let’s get to work! 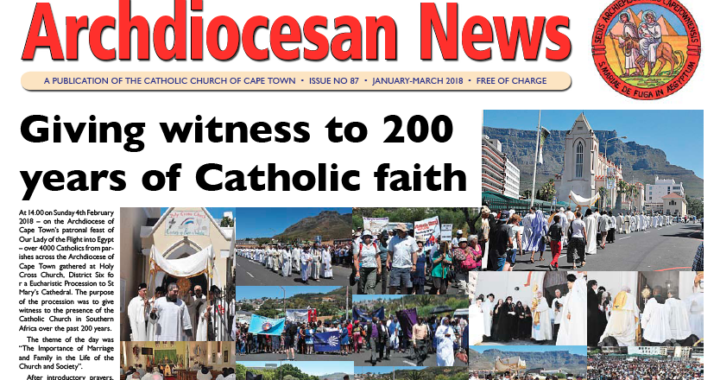 ; UCAP Congress counted among the best; Secular Franciscans host first pan-African Congress; Catholic Men’s Ministry; Football and Potjiekos in Fish Hoek; Children Serving Children – Holy Childhood Mass; Theology Course 2019; News from the Catholic Schools’ Office; St Joseph’s Home for Chronically Ill Children. 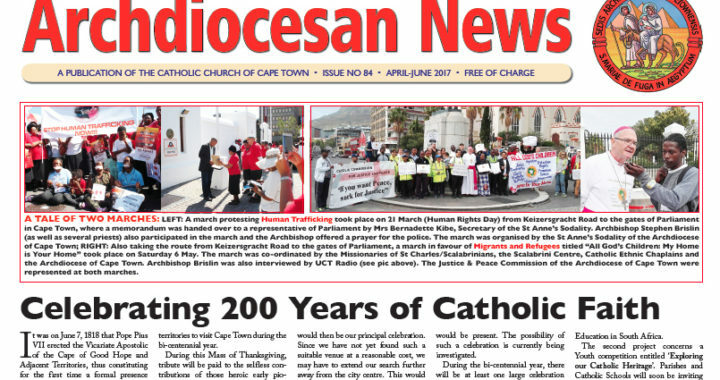 HOT OFF THE PRESS: Giving Witness to 200 years of Catholic Faith; Mini World Youth Day 2017; Christian Brothers’ Centre; Sixty Years a Priest; Be a Current of Grace; Vocations Crisis; Focus: St Joseph’s Home; Prayer for Rain; Honouring our Widows; Buckets of Love exceed expectations. 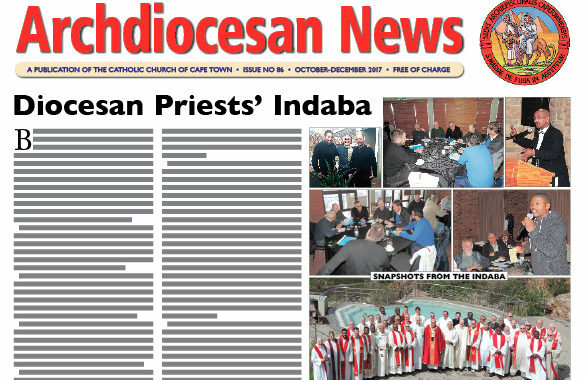 HOT OFF THE PRESS: Diocesan Priests’ Indaba; 60th Jubilee for German-speaking Catholics; Festival of Nations Mass; Child Safeguarding Workshop; World Day of Prayer for Creation; Visit from Archbishop Makgoba; Bp Cawcutt celebrates 25 years; Consider volunteeing for Prison Ministry; Sent out on Mission…; Our Catholic NGOs – Help the Rural Child; Catholic Schools’ News; Catechetics Festival; Joy as St Anne’s Girls celebrate 35 years; Buckets of Love… and much more! 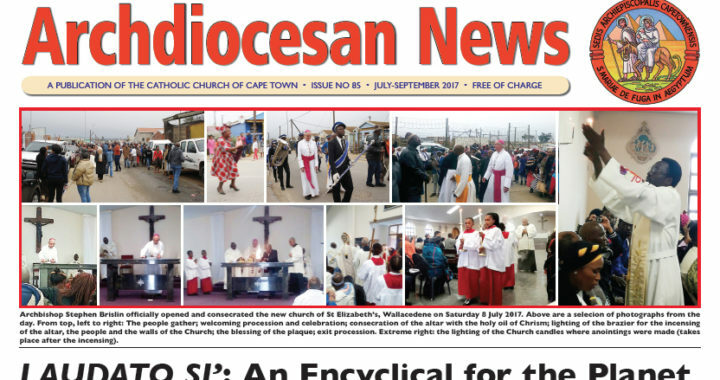 HOT OFF THE PRESS: Opening of the new church of St Elizabeth’s, Wallacedene; Laudato Si’ – An Encyclical for our Planet; Winter Living Theology on Addiction; Youth News and Events; Ecclesia Festival for the new season of Ecclesia; Bi-centennial Heritage Projects for Schools and Parishes; Feature on The Caring Network; Honouring the Heritage of Catholic Education… and much, much more. 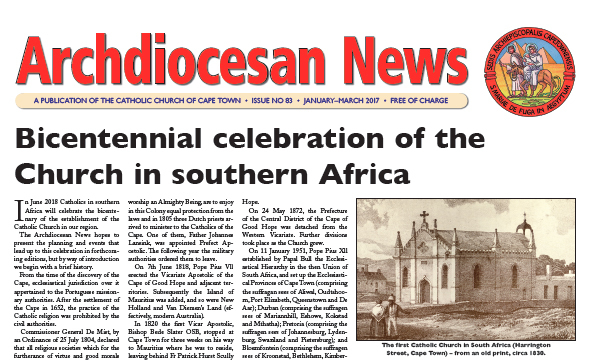 HOT OFF THE PRESS: Celebrating 200 Years of Catholic Faith; A Tale of Two Marches; Mission Accomplished – our new church in Wallacedene; Hearing the Voice of the Good Shepherd; Womens’ Conference in Lentegeur; Help a Seafarer this Sea Sunday; Prayer and Life Workshops; A Lenten Journey to Easter; and lots more! 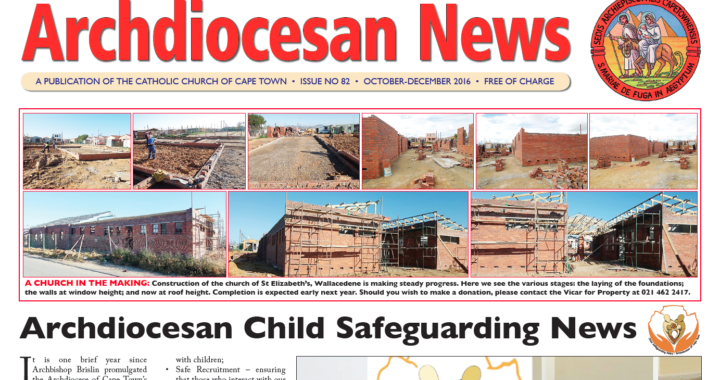 HOT OFF THE PRESS: Archdiocesan News 1 of 2017. HOT OFF THE PRESS!! 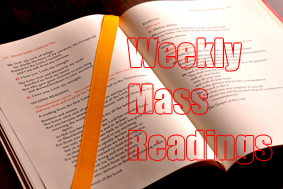 Read the final Archdiocesan News for 2016 online. 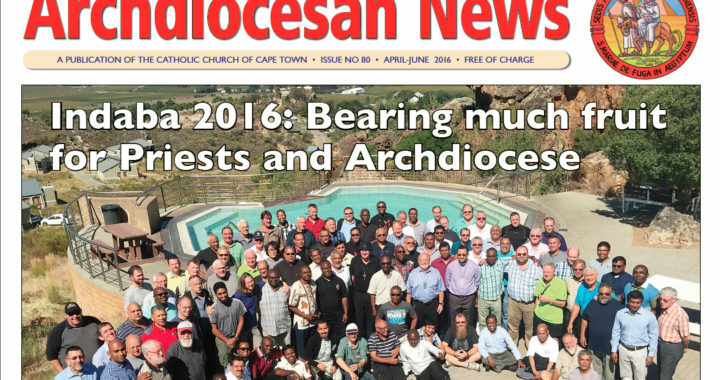 Here is the digital version of Archdiocesan News 3 of 2016.